Ruki makino: A genius when it comes to fighting. Her mother was 17 when she had her, so her mother is very young. Her mother always has men around her and Ruki doesn't like this, so she wears the shirt with the broken heart. Digimon: Renamon. Renamon's Champion Form: Kyubimon? Ruki is kind of a warrior at heart, and always ready to fight. Takato matsuda: The good boy, he does anything that an adult tells him to. He is very mature in that since, but isn't mature when it comes to emotions. He doesn't have many close friends. He is much like Lee, so when they meet they become friends. Lee zenyra: His mother is Japanese, and his father is Chinese. He has 2 sisters, one older and one younger. He doesn't have many close friends, and when he meets Takato, they become fast friends. Digimon: Terriermon (digivolves to Gargomon) He is considered the serious one of the group. Suzie is Henry's little sister. She ends up being a tamer when she accidentally falls into the digital world and meets Antylamon, one of the "devas". She and Lopmon (who digivolves back into Antilomon) assist in the fight against the D-reaper towards the end of the season. At the beginning of the season, she hides any knowledge of Digimon in front of her friends. She seems to be lonely.When she first met Leomon, Leomon could not accept the fact that she would behis tamer. 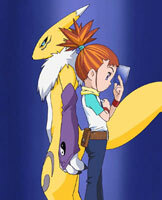 Towards the end of the season, Jeri becomes possessed by the D-reaper following the loss of her digimon, Leomon. 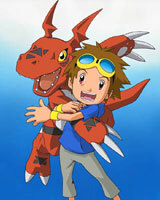 When he finds out Takato is a real digimon tamer, he insists on traveling to the digital world with his friends in search of a digimon partner. He is the last of all the tamers to get his D-power. Kenta is the typical recipient of jokes, but he takes it good-naturedly. Kazu is the character who is always making fun of someone.Kazu gets his digimon in the digital world, when he helps Andromon, towards the end, he and his digimon play a lesser role in fighting the D-reaper. 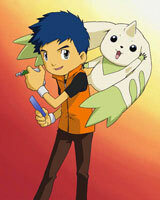 Ryo is the "top dog" when it comes to tamers. It was rumoured that Rika wasn't the Digimon Queen until Ryo left town. He doesn't show up until the tamers are in the digital world, looking for Calumon. His "quest" is not to save the world, but to help his digimon, Cyberdramon, find his ultimate enemy. Later, the tamers find out that their destinies and Ryo's are intertwined. Also, Ryo has a "special" D-power, that is all blue with silver and he uses it as a whip when Cyberdramon gets out of control.